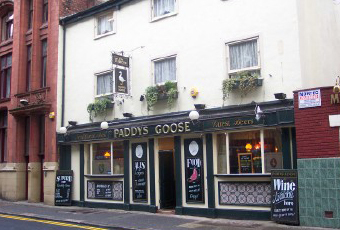 Just round the corner from the Molly House in the Gay Village, this pub is now called the Goose. It was the busier of the two pubs we visited. London Pride & Dizzy Blonde were the two real ales. Staff were friendly. But I wouldn't rush back here. Lovely place,nice people good service. There with friends and we had fun. Not sure why these negative comments have been posted. Paddy's is a very friendly pub, and I've always found the staff and service great. Been going in regularly for three years, and never seen a fight in there once. Don't jump the the conclusion that every scally lad in the village is a rent boy. a proper pub amid the sea of bars and takeaways.